Today the comedy community, and practically everyone I know, was saddened to learn of yet another WTF guest’s premature demise–making the now revered Robin Williams episode in many ways a memoriam for the beloved Academy-Award winning actor. 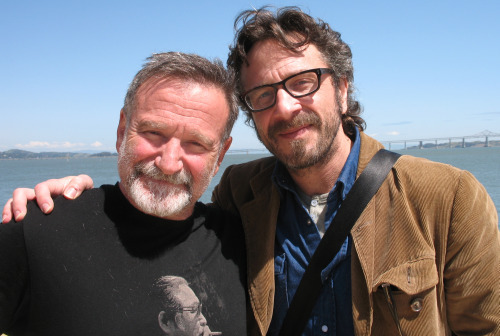 My apologies to Marc Maron for posting the unauthorized YouTube upload of Williams’s interview, but it was readily available. Thought I’d make both versions an option. Truly a wonderful episode; just two guys at what we now know to be a turning point in their careers and personal lives. Take a listen. Marin County Coroner investigators claim the “the death to be a suicide due to asphyxia.” The actor was reportedly suffering from extreme depression, and had been in a rehabilitation facility for substance abuse as recently as July. Our thoughts and prayers go out to his family. Those of us who grew up on this guy are really feeling this. We’ll miss you, Mr. Williams. Nanoo nanoo. I used to be 24. I used to work evenings, at a bar four days a week. The rest of my week was wiiiiide open. So what did I do with all of that glorious free time? Pursue lofty intellectutal endeavors? Tackle personal career goals? Embrace the night life my buzzing metropolis had to offer? Occasionally. But mostly I just sat around with my dude friends and watched TV. And what did we watch you ask? Mythbusters was certainly a favorite, at least for the first two or three seasons. My familiarity with Discovery’s urban myth debunker is probably why it was so easy for me to fall back in step with Adam Savage’s friendly, mildly narcissistic cadence. Still Untitled: The Adam Savage Project is part of Jaimie Hyneman and Savage’s Tested Network. They have a glut of videos and other shareable content. It’s a pop culture treasure trove. On the podcast, Savage is joined by Will Smith and Norman Chan, savvy tech and culture experts who seem to be the gas in Tested’s tank. It would be easy call this show “nerd culture;” but I think we’re all over that aren’t we? It’s getting to where I ignore any new content provider that has the word “nerd” or “geek” in it. Untitled gets it right. Taking a page from Patton Oswalt, the show is about passion. And those passions could be anything: cooking, coffee, crosswords. Like most podcasts, this show boils down to engaging conversation.